As your grass wakes up from it’s winter hibernation, it requires a good feed which contains a high percentage of Nitrogen (N). This gives it the ability to put most of it’s energy into leaf growth to take full advantage of the longer, warmer, sunnier days. 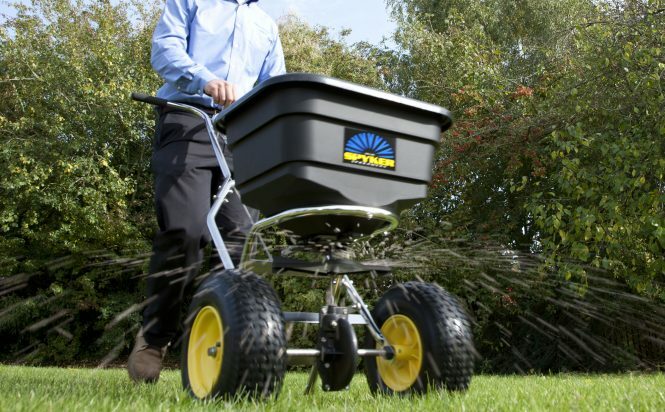 The first regular treatment of the new season is a carefully selected granular, non-scorch, slow release fertiliser which gently feeds your lawn during its initial growth stage. This improves your lawns colour and health, by providing all the nutrients it requires at this important time of the year. Additionally, I also apply a low temperature liquid herbicide. This will stop early weed development, and to kill any weeds that may have survived the winter. Replaces nutrients lost washes out during winter rains. Kills any weeds that may have over-wintered, or germinating weeds seeds that have blown in on the wind. You will need to start mowing the lawn regularly. Lawns can grow quickly as soon as the soil warms. The first fertilisation and weed control treatment of the year is applied March or April. However exact time will depend on the weather conditions. Winter can sometimes creep well into April. As long as the grass has started growing strongly, this treatment is suitable. Treatment 1 can be applied in a variety of weather conditions. If a strong weed control is needed then a dry, calm day is preferred. There is no preparation needed before the spring treatment can be applied, although I recommend not applying the treatment within 3 days of mowing. I will contact you before the treatment to work within your mowing schedule. If a herbicide has been applied with treatment 1, then I recommend staying off the lawn for a couple of hours, until it is dry. If the weather is unusually hot or dry, then your lawn may benefit from regular irrigation to help use the feed most effectively. The aim of the first spring feed of the year is to get the nutrients into the grass plants as efficiently as possible. If the lawn is untidy, a spring clean scarification is a great treatment to tidy the lawn and give it space to grow new leaves. If the lawn has not been aerated in a year or more spring is a perfect time for it. Hollow-tine aeration and then feeding straight after will get the nutrients down to the roots quickly and give the grass a great start to the season. A seaweed biostimulant treatment can also be applied. This would give a great additional boost of much-needed micro nutrients to the lawn and feed the soil bacteria.